Cutthroat Taverns has often been described as a diceless RPG game and that has never been closer to the truth than with this expansion. That's because we introduce players to the devastatingly cruel new monsters, thought provoking additions to the Event deck and even more hugely powerful Relics with two action-packed, full-on Adventure Modules. Just living and having the most Prestige may no longer be enough to secure a win. And living is no easy matter. Ragnarok the End Bringer is aptly named. Greed allows any Attack card to be played as a Critical Miss. The Lich will turn fallen friends into fallen fiends. All that and you'll need to effect a rescue too. 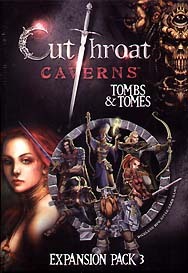 This is not a complete game, you must own a copy of Cutthroat Caverns to Play.